Taller de iniciacion al Mundo del Caballo. Factory of initiation to the World of the Horse. Su objetivo principal es familiarizar al niño con el caballo, logrando un manejo basico, que pierda todo tipo de temor y disfrute de esta relacion, hemos comprobado que el trabajo con caballos reporta innumerables elementos positivos para los seres humanos. 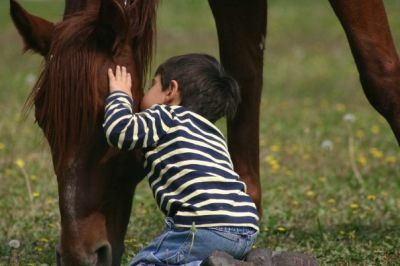 Its primary target is to familiarize to the boy with the horse, being obtained a basic handling, that loses all type of fear and enjoys this relation, we have verified that the work with horses reports innumerable positives elements them human beings. Fomenta la confienza y la concentracion. Incrementa la interaccion social y la amistad. Mejora el autocontrol de las emociones. Mejora la capacidad de atencion. Ayuda a relacionarse con personas que no pertenecen al entorno familiar o escolar. Desarrolla respeto y el amor hacia los animales. It foments confidence and the concentration. It increases the social interaction and the friendship. It improves the automatic control of the emotions. It improves the attention capacity. Aid to be related to people who do not belong to the familiar or scholastic surroundings. It develops to respect and the love towards the animal. Los cursos son limitados con un numero maximo de 6 personas. The courses are limited with I number maximum of 6 people.